Do you need a restorative dentist in the Eastern Suburbs? Here at Hooper Tooth Conserving Dentistry in the Eastern Suburb of Rose Bay, our principal dentists aim to provide services that go beyond simple dental check-ups with minimally invasive dentistry. With an array of treatments for preventing decay and damage, restoring teeth and cosmetically enhancing smiles, Joe and Gerry Hooper focus on keeping your smile healthy for life. 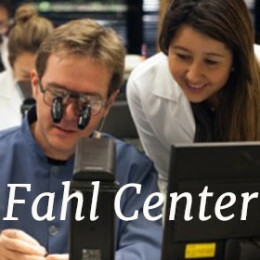 There are a few different key focus points that separate a regular dentist from a minimally invasive dentist (MID). Minimally invasive dentistry is really about doing everything within our power to preserve as much of your natural hard and soft tissues as possible. Often times with regular dental treatments your dentist may remove more of the tooth’s natural structure than necessary, causing the tooth to need a greater restoration. Rather than damaging the tooth structure, minimally invasive dentistry combines skill and precision to remove only the decay and debris from the tooth. This way the tooth has a greater chance of being restored with an onlay without the need for a dental crown. 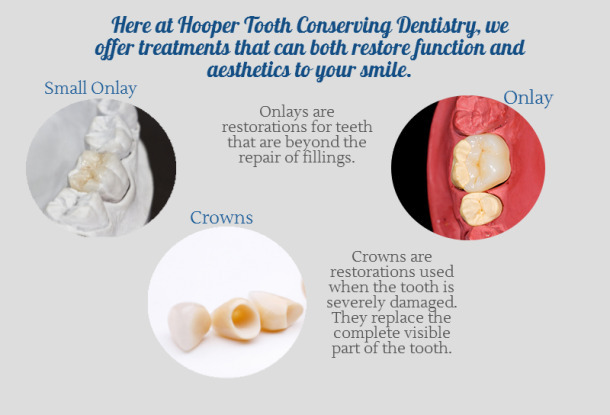 Thanks to advancements in dental technology and materials, at Hooper Tooth Conserving Dentistry we can provide cosmetic dentistry and restorative dental treatments that conserve more of the natural tooth. As we discussed in our last article “3 reasons why onlays are a better alternative to crowns” we explain that when it comes to cracked, broken or damaged teeth, repairing the tooth can be pretty stressful and quite costly at times. To help reduce the stress of your dental visits, the Hoopers provide onlays as an alternative to crowns where possible. Onlays and crowns: what’s the difference? Both onlays and crowns are used to restore structural integrity and appearance of damaged teeth. In cases where the tooth has become chipped, broken or decayed beyond the repair of a filling, an onlay could be the most appropriate restoration for the tooth. Rather than acting as a cap over the visible part of the tooth like that of a crown, an onlay is personally customised to bond securely to remaining parts of the tooth. This allows the restoration to act as a regular tooth without losing too much of the tooth’s structural stability. By using as much of the tooth’s natural structure as possible as the foundation for the restoration, we can help to minimise the size of the restoration along with the price associated with your treatment. If you have been to a dentist and they have recommended a dental crown for your damaged tooth, it’s important to consider getting a second opinion. Are you thinking of improving your smile? Cosmetic dentistry doesn’t only include treatments that whiten your teeth but it can also be used to disguise cracks and chips. Treatments like porcelain veneers and composite resin veneers have the capability to improve a number of different cosmetic concerns. 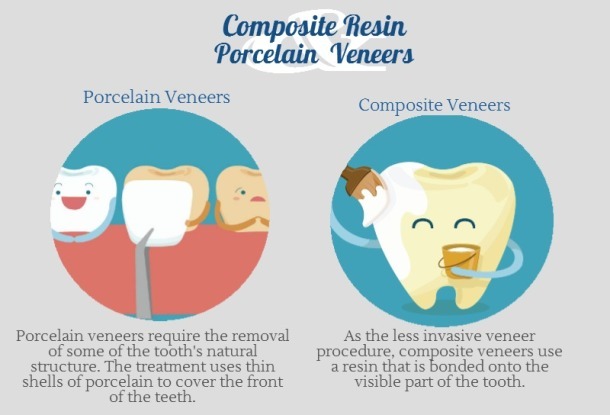 Porcelain veneers and composite resin veneers: what’s the difference? Although both composite resin veneers and porcelain veneers are able to give the teeth a more attractive appearance, the treatments are not quite the same. Composite veneers offer a more biologically friendly approach with the chance for single day application. As the less invasive veneer procedure, composite veneers use a resin that is bonded onto the visible part of the tooth. This resin is strong and provides a solid natural looking replication of the tooth’s enamel. Porcelain veneers on the other hand are complete covers for the front of the teeth. Custom designed as thin tooth-shaped shells of porcelain, this cosmetic treatment requires the removal of a small amount of the natural tooth’s enamel before being placed. Depending on which treatment is better suited to your needs, your Hooper Tooth Conserving Dentistry will ensure you have all the necessary information prior to commencing your treatment. Do you want to keep your smile healthy, strong and beautiful for life? Book a consultation with Hooper Tooth Conserving Dentistry for a conservative and restorative dentist in the Eastern Suburb of Rose Bay today.